Miguel Ángel Margáin, Director General of the Mexican Institute of Industrial Property, took office in early 2013, and was in Geneva for the annual World Intellectual Property Organization General Assemblies. William New of Intellectual Property Watch sat down with him for an interview. He spoke about achievements of the office during this administration, major amendments to adhere to global treaties and changes in the NAFTA, the introduction of geographical indications, and the ascendance of IP rights in Latin America. Under this administration, which took office in late 2012, the Mexican Institute of Industrial Property (IMPI) has had in mind to have a user-oriented service â€“ not a free service, they charge for trademark and patent applications â€“ focused on what the user wants and needs, he said. Users range from global corporations to local businesses. MargÃ¡in was an IP attorney for some 20 years before taking government office, and was â€œa user of the Mexican IP system,â€ which gave a perspective on the officeâ€™s services, he said. MargÃ¡in started in January 2013, shortly after President Enrique PeÃ±a Nieto took office in December 2012 with a focus on digital government. Now the president is in his final weeks, with his term ending on 30 November 2018 with no possibility of re-election as under Mexican law. In this administration, the focus for intellectual property was on e-filings, asking how can the full prosecution of the application be done online. At the moment in Mexico, it is possible to get a birth certificate online, so why not applications, he asked. As of today, about one-third of trademark applications are filed in Mexico City, one-third in one of the five regional offices (Guadalajara, Merida), and one-third online. And they found out that the ones using the electronic trademark applications are small and medium-sized businesses and individuals, not the big users. They have e-filing, now they are focused on making the whole prosecution electronic, he added. They are starting as of last year to have e-patents. For patents, 65 percent of applications are filed in the Mexico City office, 20 percent in the regions, and 15 percent online, MargÃ¡in said. The focus now is on promoting it, he said. â€œIf you want to foster the IP culture, you cannot do it with an obligation. You have to have options,â€ but the aim is to â€œone dayâ€ have the process be fully electronic. So far in Mexico only the national tax service has achieved that. Meanwhile, trademarks and patents continue to climb in the country. Trademark applications have gone up an average of 10-12 percent per year since he took office in 2013, he said, while patent applications have risen by some 1-2 percent per year in that time. The office is seeing more complex patents coming in, and pharmaceuticals is the biggest user of the system because of the complexity and time spent on them, making up some 16 percent of total patents, followed by the automotive industry. Designs are also on the rise, he said, and they expect to accede to the WIPO-managed Hague System on registration of industrial designs in the coming weeks. The accession has been signed by the Mexican president and the document is in the Senate awaiting ratification. With the Madrid System on the international registration of trademarks, Mexico has joined only Colombia and Cuba in the Latin American region. An interesting issue for Mexico has been geographical indications, products named for a specific region and characteristics. Until March of this year, Mexico had only appellations of origin, a higher level of protection, it did not have GIs until March 2018. Now has adopted a new system for GIs. The first amendment of this administration was two years ago, Mexico instituted trademark opposition. Then last year passed an amendment related to GIs and designs. The latter is in order to getting things in line for its accession to the Hague Treaty. The third amendment has been a new trademark amendment that expanded Mexicoâ€™s law to include non-traditional marks, sound, movement, trade dress, and secondary meaning, and has extended bad faith registrations. It also includes certification marks. In the renegotiation of the North American Free Trade Agreement, NAFTA 2.0 as he called it, they have worked in both the GI and trademark systems in a complementary way. GIs will be looked at from the producer side, he said, as for GIs, the owner is the state not the producer. So far, Mexico has 16 appellations of origin: tequila was the first, from nearly 45 years ago, and the latest, under this administration, are cacao grijalva from the state of Tabasco, and jahualica, a special chile from Guadalajara. For a GI, he cautioned that it is a lot of work, involving â€œdeep studyâ€ on natural and human factors, and analysis by university or research centre experts. Most GIs are related to agriculture, but Mexico so far has three non-agricultural appellations of origin: a special handicraft wood, Talavera clay, and amber from Chiapas, he said. MargÃ¡in speaks about ideas as children, making the comparison that the first thing you do when a child is born is â€œregisterâ€ them with a birth certificate, the same as obtaining intellectual property rights. â€œThere has to be legal certainty,â€ he said. The next step is to then exploit the IP, and then to respect that of others. â€œFostering IP culture is at all levels,â€ MargÃ¡in said, both in public and private sector. Mexico’s IP office is the biggest IP office in the Spanish-speaking world, and perhaps the most efficient, he said. For the region, â€œwe have to give IP the place in the agenda that it deserves,â€ he said, since it is a vital part of the knowledge economy, entrepreneurship and the economic sector. He noted the responsibility that comes with his officeâ€™s extra competency in IP enforcement, which other IP offices typically do not have. 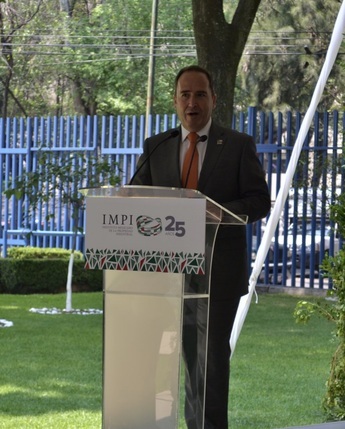 IMPI is turning 25 years old in December, itself a NAFTA institution established by the 1994 agreement. The text of the Mexico-US agreement to update NAFTA is expected to be made public as soon as this week, and when it comes out, it will show the most advanced agreement yet on IP, he said. A key issue is the obligations Mexico is taking on under its agreements, including NAFTA, the European Union, and the CCPCT. MargÃ¡in was asked what he has brought from his private sector background to his first public sector job, and what he has learned that surprised him in his government role. He said he brought the user orientation to the role, and that he has now seen firsthand the tremendous workload of the public sector. He said the office has managed to maintain high patent quality, which he said is evidenced by Mexico being the first country to have a Patent Prosecution Highway with the IP5 biggest global patent offices (US, Europe, China, Japan, Korea). To accomplish that, Mexico had to adopt some amendments to its IP laws. On the global level, MargÃ¡in looked first at Latin America and said each IP office director general needs to put IP at the top of the agenda, noting, â€œAs a region, we are left behind in some treaties.â€ His office is frequently consulted by other offices in the region, he said. "Interview With Miguel Ángel Margáin, Director General Of The Mexican Institute Of Industrial Property" by Intellectual Property Watch is licensed under a Creative Commons Attribution-NonCommercial-ShareAlike 4.0 International License.